After Le Mans, Suppo flew to Italy and quickly appeared at the hospital. He did not leave the hospital until the Hayden family did. 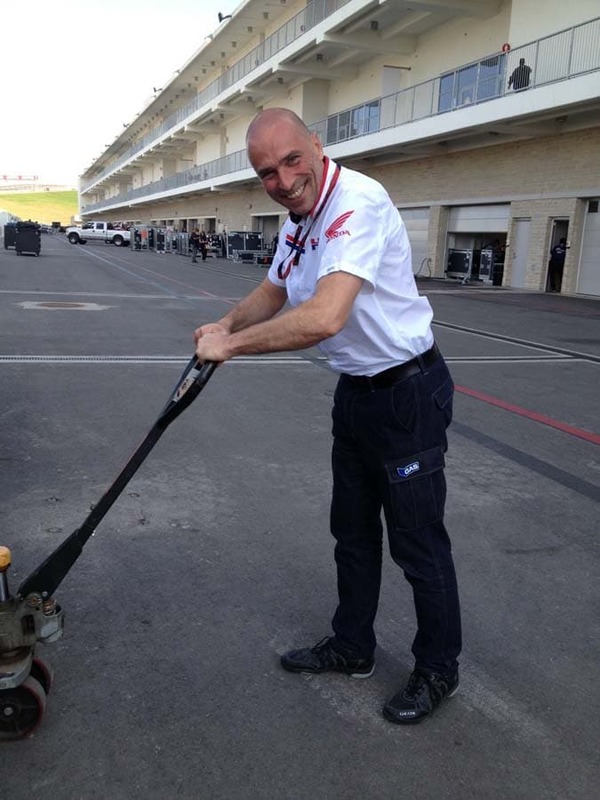 Suppo helps load the crates at CoTA in 2013. As a pre-teen, Livio Suppo was an admirer of America. He attained one of his dreams not many years later when he was able to visit America and race a dirt bike through the California desert. Pulled into Ducati’s WSBK program, Suppo especially enjoyed the Laguna Seca rounds. When Suppo returned to Grand Prix racing with Ducati, he courted Nicky Hayden and brought him to the Ducati MotoGP team after Hayden and HRC split. A good working relationship ensued between the Italian and the American, but also a friendship that lasted until Hayden’s tragic death. There are many pleasurable on-track memories in the latter chapters of Nick’s career. After 2006, the podium at Indy on the Ducati, the WSBK win in Sepang and the podium at Laguna Seca WSBK were high points of Nicky’s late career joy. Yet, I sometimes wonder if Nick was ever professionally happier than when he received the surprise call to fill in for Dani Pedrosa on the Repsol Honda MotoGP team for the Australian GP in 2016. Suppo undoubtedly influenced HRC’s decision to send Hayden to Phillip Island. Smilin’ Nick made a good showing on the RC213V, running in the top ten until late in the race when some bonehead punted him to the ground. Even with the DNF, Nick remained really happy to be back on a top Honda MotoGP bike. Just losing a brother in a close family like the Hayden clan is a tragedy. Add in all the logistical nightmares of the incident happening in a foreign country–especially Italy which is fraught with political skirmishes on all levels when the injured is a well-known sportsman–and the emotional toll is compounded. We can all hope to never know the seemingly endless red tape the Hayden family and poor Jackie endured in May of 2017. All the while we, friends and fans of Nicky, did what we could to support the family as Tommy and Rose flew from Kentucky to Italy in order to tend to Nick. We sent good vibes, prayers or perhaps statements of love and support. Is there a more empty and yet deeply empathetic statement than “If there’s anything I can do …”? Livio Suppo, meanwhile, was at the Le Mans MotoGP race when the news broke about Nicky being seriously injured. As the acting principle of the factory Honda team, normally his time is regimented in half-hour long meetings for weeks in advance. ‘Monday I fly to Japan for meetings but I am back at Brno on Friday afternoon’ one of his old text messages read. After Le Mans, Suppo flew to Italy and quickly appeared at the hospital. He did not leave the hospital until the Hayden family did. He was there, for days, assisting his friend and the Hayden family in any way he could. Doing so ranged from explaining and consoling Jackie and Tommy to in the next moment, being really the absolute last guy an Italian hospital wants to give a less than satisfactory answer to. Livio Suppo in part orchestrated Stoner’s title at Ducati, brought Stoner to Honda and also made a path for his replacement, Marc Marquez, to enter MotoGP and change racing history. These are not insignificant accomplishments. Suppo was also a good friend to Nicky Hayden, and gave him one of the happiest weekends in the closing days of his racing career. And when the unthinkable happened, Suppo didn’t let anything in this world prevent him from being there for Nicky when his family needed help. Livio Suppo was a good friend to Nicky Hayden. Thanks, Liv, from all Nick’s fans and friends.